Amid ongoing protests, 64 percent of Pakistanis have a favorable view of Prime Minister Nawaz Sharif. Despite massive protests in Islamabad calling for his ouster, Prime Minister Muhammad Nawaz Sharif remains widely popular among the Pakistani public, according to a new opinion poll. 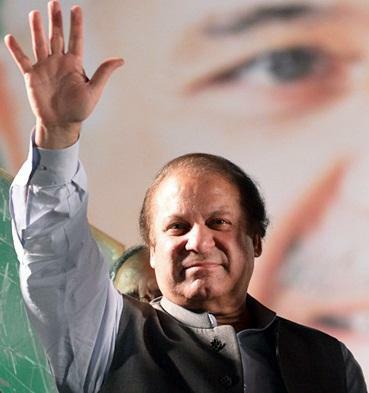 On Tuesday Pew Research Center released a new opinion poll that found that 64 percent of Pakistanis have a positive view of Prime Minister Sharif, compared to just 32 percent who view him unfavorably. This makes Sharif more popular than Imran Khan, the former cricket star turned opposition politician who is leading the protests demanding that Sharif step down. According to Pew, just 53 percent of Pakistanis have a positive view of Khan, compared to 24 percent who view him unfavorably. Most tellingly, Sharif’s popularity has remained largely stagnant while Khan’s is in sharp decline. In the weeks before he was elected to his current position, Pew found that around 66 percent of Pakistanis viewed him favorably– just 2 percent more than currently do. His current 64 percent approval rating is also 2 percent higher than it was in 2012 when just 62 percent of Pakistanis held a favorable view of Sharif. By contrast, Khan’s favorability ratings have continued to decline precipitously. His current favorability rating of 53 percent is down 7 percent from last year and a striking 17 percent from 2012. These numbers suggest that Pakistanis are largely happy with how Sharif has been governing the country, while they are less satisfied with how Khan has been handling himself outside of it. At the same time, the survey is based on face-to-face interviews conducted with 1,203 respondents between April 15 and May 7, 2014, long before the current round of protests. Still, other measurements suggest that Pakistanis have been largely satisfied with Sharif’s governance. For example, while only 25 percent of Pakistanis feel their country is headed in the right direction, this is a more than three-fold increase from last year when only 8 percent felt that way. Similarly, those saying that the economy is in good shape have more than doubled over the last year, from 17 percent in 2013 to 37 percent today. Another 36 percent of those surveyed believe that the economy will improve over the next 12 months. Pakistan’s military continues to be far more popular than either Sharif or Khan, however. A shocking 87 percent of Pakistanis say the military has a good influence on the nation, up from 79 percent last year. Despite Sharif’s popularity, protests continue to grip Islamabad and are now entering their 14 day. After talks between the government and opposition leaders broke down on Thursday, both Khan and Tahir ul-Qadri, a cleric who is also leading the protests, predicted that Khan would step down before day’s end. Don’t bet on it. Besides lacking much in the way of public support, the Wall Street Journal is reporting that Sharif is close to reaching a deal with the military in which the premier will relinquish control over security affairs and strategic foreign policy to the generals. As Ankit and I discussed on last week’s podcast, it is likely that the military has been tacitly supporting the protests in a bid to gain more influence over Sharif. Sharif would only willingly give the control over security issues and strategic foreign policy if the generals promised to withdraw any support for Khan and Qadri. If anything, the protests are likely to end soon with their demand for Sharif to resign unmet.